Lightweight Directory Access Protocol (LDAP in short) is an industry standard, lightweight, widely used set of protocols for accessing directory services. A directory service is a shared information infrastructure for accessing, managing, organizing, and updating everyday items and network resources, such as users, groups, devices, emails addresses, telephone numbers, volumes and many other objects. The LDAP information model is based on entries. 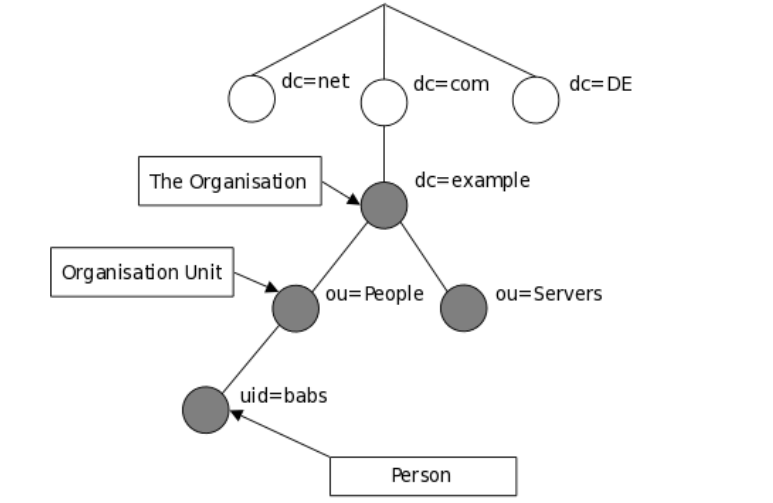 An entry in a LDAP directory represents a single unit or information and is uniquely identified by what is called a Distinguished Name (DN). Each of the entry’s attributes has a type and one or more values. An attribute is a piece of information associated with an entry. The types are typically mnemonic strings, such as “cn” for common name, or “mail” for email address. Each attribute is assigned one or more values consisting in a space-separated list. The following is an illustration of how information is arranged in the LDAP directory. In this article, we will show how to install and configure OpenLDAP server for centralized authentication in Ubuntu 16.04/18.04 and CentOS 7. 1. First start by installing OpenLDAP, an open source implementation of LDAP and some traditional LDAP management utilities using the following commands. On Ubuntu, during the package installation, you will be prompted to enter the password for the admin entry in your LDAP directory, set a secure password and confirm it. When the installation is complete, you can start the service as explained next. 3. Next, allow requests to the LDAP server daemon through the firewall as shown. 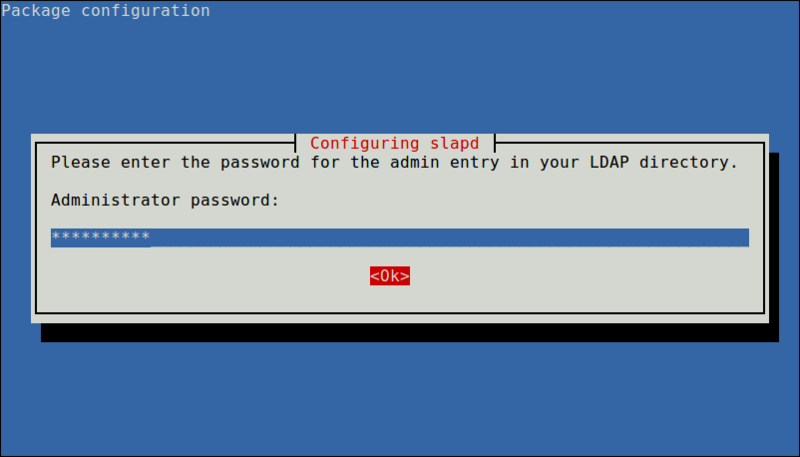 Note: It is not recommended to manually edit the LDAP configuration, you need to add the configurations in a file and use the ldapadd or ldapmodify command to load them to the LDAP directory as shown below. 4. Now create a OpenLDAP administrative user and assign a password for that user. In the below command, a hashed value is created for the given password, take note of it, you will use it in the LDAP configuration file. 5. Then create an LDIF file (ldaprootpasswd.ldif) which is used to add an entry to the LDAP directory. olcDatabase: indicates a specific database instance name and can be typically found inside /etc/openldap/slapd.d/cn=config. cn=config: indicates global config options. PASSWORD: is the hashed string obtained while creating the administrative user. 6. Next, add the corresponding LDAP entry by specifying the URI referring to the ldap server and the file above. 7. Now copy the sample database configuration file for slapd into the /var/lib/ldap directory, and set the correct permissions on the file. 8. Next, import some basic LDAP schemas from the /etc/openldap/schema directory as follows. 9. Now add your domain in the LDAP database and create a file called ldapdomain.ldif for your domain. 10. Then add the above configuration to the LDAP database with the following command. 11. In this step, we need to add some entries to our LDAP directory. Create another file called baseldapdomain.ldif with the following content. Save the file and then add the entries to the LDAP directory. 12. The next step is to create a LDAP user for example, tecmint, and set a password for this user as follows. 13. Then create the definitions for a LDAP group in a file called ldapgroup.ldif with the following content. In the above configuration, gidNumber is the GID in /etc/group for tecmint and add it to the OpenLDAP directory. 14. Next, create another LDIF file called ldapuser.ldif and add the definitions for user tecmint. then load fthe configuration to the LDAP directory. For more information, see the appropriate documentation from OpenLDAP Software document catalog and Ubuntu users can refer to the OpenLDAP server guide. OpenLDAP is a open source implementation of LDAP in Linux. In this article, we have shown how to install and configure OpenLDAP server for centralized authentication, in Ubuntu 16.04/18.04 and CentOS 7. If you have a question or thoughts to share, do not hesitate to reach us via the comment form below.